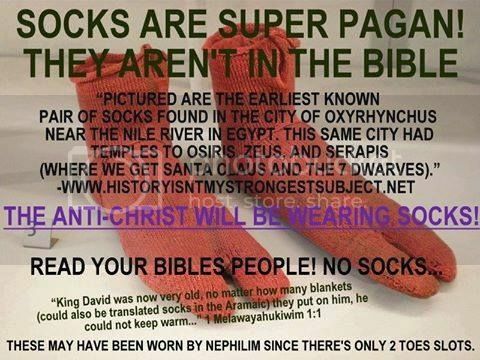 Did You Know That 'Socks Are Super Pagan'? Yesterday, a friend of mine shared this cringe-worthy image on Facebook in an attempt to call attention to the so-called "Christian" theories masquerading as "Biblical truth" that exist in this day-and-age. I wish that was a joke, like the latest creation by Lutheran Satire or The Babylon Bee or something, but it's not! As he properly stated, "Somehow this captures the essence of Facebook nuttiness. Rather than promote the one King, a lot of people spend their days promoting theories that do nothing." I'm surprised at you! Do some more digging, Bruce. You obviously haven't seen the 4.5-hour YouTube video presentation on how the popularity of the "Sock Monkey" is Satanic and directly connects to all of this. There's even a chilling tie-in to Peter Gabriel's "Shock The Monkey" that proves beyond a shadow of a doubt that we've all been conditioned to receive the "Mark of the (Monkey) Beast" willingly b/c of all of this. All kidding aside, I gotta say that that's one of the most bizarre theories I've ever seen too. This is what's so sad about a segment of Christianity today though. There are some people who truly mean well, and who profess a love for the Lord and His Word, but for whatever reason they get so caught up and deceived by the "myths and endless genealogies" (1 Timothy 1:4) that are out there, and then they fixate on just one verse, or one or two passages of Scripture, and then take it out of context to support their twisted view. 1 Timothy 1:3-4 (ESV) As I urged you when I was going to Macedonia, remain at Ephesus so that you may charge certain persons not to teach any different doctrine, nor to devote themselves to myths and endless genealogies, which promote speculations rather than the stewardship from God that is by faith. I'll admit, yes, there was a time when I was that type of a believer (though not to this extreme!). Even so, a lot of the "Christian Conspiracy Theories" that I believed and propagated myself were absolutely insane and ridiculous!I've since repented, of course. Thanks be to God that His grace pulled me from that path. See, this is what I've come to cherish about what we believe, teach, and confess as Lutherans, which is simply a "same saying" of what the Word of God already tells us. What does it tell us about such crazy beliefs like always subjectively finding religious symbolism and spiritual truths in things like socks let's say? Therefore we ought and must constantly maintain this point, that God does not wish to deal with us otherwise than through the spoken Word and the Sacraments. It is the devil himself whatsoever is extolled as Spirit without the Word and Sacraments. Things like the above meme and the accompanying theory it espouses is proof of where "enthusiasm" always leads people. Which Part Of "From The Devil" Don't You Understand? Lutherans have such a robust, tangible, mystical, and beautiful pneumatology. That any of our preachers would exchange this priceless treasure for the imaginary trinkets of enthusiast snake oil salesmen is a travesty. It robs people of the true joy of genuine Gospel comfort that can be found in the very real voice of God that IS speaking to us, not to give us secret information like some sort of voodoo psychic, but to comfort and assure us that we are genuinely loved, absolutely His, fully forgiven and accepted into His family, for Jesus' sake. The Jesus who is God speaking to us says, "This is my body, which is given for you." "Your sins are forgiven." "Surely I am with you always." This voice is the ONLY one we need to hear, it is the ONLY one that gives hope, and any Lutheran pastor or congregation worth their salt will make THIS voice the heart and soul of their spirituality. To do otherwise is to take Jesus from the people with one hand, and leave them with the traditions of man, certain preparations of our own invention. Damned sinners don't have time for such presumptuous games! Which part of "from the devil" don't you understand? Remember, we are expected to "take no part in the unfruitful works of darkness, but instead expose them" (Ephesians 5:11). In a Lutheran layman's terms, no, socks are not super pagan.